XYPN offers an ever-growing multitude of benefits to our members, like compliance and marketing support, plenty of tech perks, and a robust community forum (not to mention hundreds of dollars worth of discounts!). 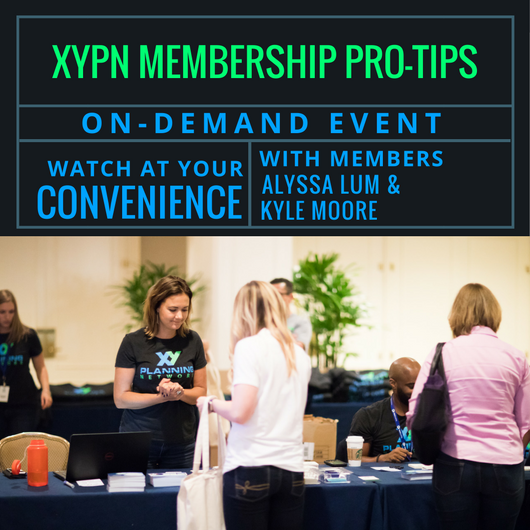 In this free webinar, XYPN members Alyssa Lum and Kyle Moore share their pro-tips for taking full advantage of XYPN membership, and how to most effectively leverage the many benefits we offer to support the success of your firm. Join us to steal their secrets and learn more about what membership with XYPN has to offer. This call is ideal for anyone thinking of joining the XYPN community. I'm a student, looking to start my own firm within a couple of years. How do I know when I've gained enough knowledge to start and waiting to long to start? What was the timeframe between quitting your job and joining XYPN to launch your firm? Did you join before quitting? Could you discuss how you budgeted for your own health care and dental expenses? What has been your greatest benefit from joining XYPN so far? How effective is the XYPN Advisor portal in connecting with potential clients? Do you know an approximate % of your clients that are sourced there? What can do before I join XYPN and start my own firm to prepare myself as best as I can? Are You Making These Top-of-Funnel Marketing Mistakes? As the founder of Luminate Financial Planning, Alyssa Lum, CFP®, MBA, helps clients take control of their financial lives, empowering them to align their financial assets with their own values and goals. Alyssa's passion for the power of planning and desire to help others build lives based on what matters most to them inspired her to found her firm. Kyle Moore, CFP®, founded Quarry Hill Advisors with the goal of helping others align their money with their values and make a lifetime of smart financial decisions with their resources. He helps busy and motivated professional take their personal finance to the next level with ongoing guidance, encouragement, and accountability.